The report was prepared within the framework of the Solar Heating and Cooling Programme (SHC) of the International Energy Agency (IEA). 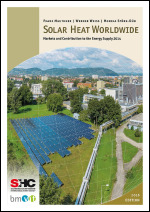 The goal of the report is to give an overview of the general trends, to highlight special applications and outstanding projects and to document the solar thermal capac ity installed in the important markets worldwide. Furthermore, it is the goal to ascertain the contribution of solar thermal systems to the supply of energy and the CO2 emissions avoided as a result of operating these systems. The collectors documented in detail are unglazed collectors, glazed flat-plate collectors (FPC) and evacuated tube collectors (ETC) with water as the energy carrier as well as glazed and unglazed air collectors. The report was prepared within the frame work of the Solar Heating and Cooling Programme (SHC) of the International Energy Agency (IEA). The goal of the re port is to document the solar thermal capacity installed in the important markets world wide and to as certain the contribution of solar thermal systems to the supply of energy and the CO2 emissions avoided as a result of operating these systems. The collectors documented are unglazed collectors, glazed flat-plate collectors (FPC) and evacuated tube collectors (ETC) with water as the energy carrier as well as glazed and unglazed air collectors. 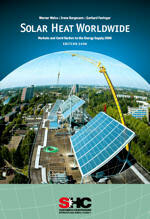 Concentrating solar collectors are not in the scope of this report. 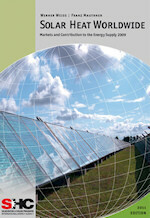 This report comprises solar thermal market data from 61 countries covering an estimated 95% of the worldwide market. The remaining 5%of the market were extrapolated and are labeled as “all other countries” in the following sections. 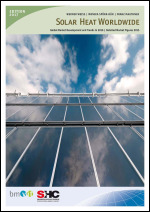 This report was prepared within the framework of the Solar Heating and Cooling Programme (SHC) of the International Energy Agency (IEA). 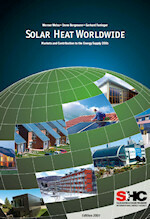 The goal of the report is to document the solar thermal capacity installed in the important markets worldwide, and to ascertain the contribution of solar thermal systems to the supply of energy and the CO2 emissions avoided as a result of operating these systems. The collectors documented are unglazed collectors, glazed flat-plate collectors (FPC) and evacuated tube collectors (ETC) with water as the energy carrier as well as glazed and unglazed air collectors. 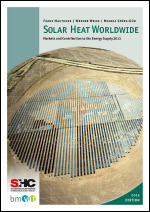 By the end of 2011, an installed capacity of 234.6 GWth corresponding to a total of 335.1 million square meters of collector area was in operation in the 56 countries recorded in this report. These 56 countries represent 4.3 billion people, which is 61% of the world’s population. 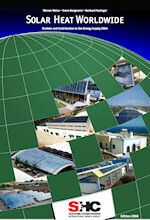 The installed capacity in these countries represents more than 95% of the solar thermal market worldwide. 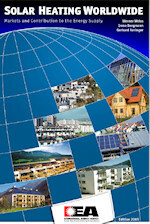 This report was prepared within the framework of the Solar Heating and Cooling Programme (SHC) of the International Energy Agency (IEA). 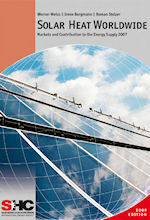 The goal of the report is to document the solar thermal capacity installed in the important markets worldwide, and to ascertain the contribution of solar thermal systems to the supply of energy and the CO2 emissions avoided as a result of operating these systems. The collectors documented are unglazed collectors, glazed flat-plate collectors (FPC) and evacuated tube collectors (ETC)withwater as the energy carrier as well as glazed and unglazed air collectors. 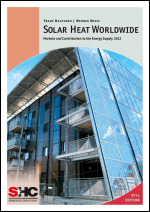 This report was prepared within the framework of the Solar Heating and Cooling Programme (SHC)of the International Energy Agency IEA). 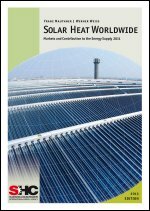 The goal of this annual report is to document the solar thermal capacity installed in the important markets worldwide, and to ascertain the contribution of solar thermal systems to the supply of energy and the CO2 emissions avoided as a result of operating these systems. The collectors documented are unglazed collectors,glazed flat-plate and evacuated tube collectors with water as the energy carrier as well as glazed and unglazed air collectors. 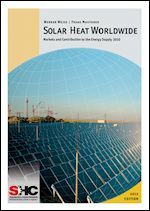 This report was prepared within the frame work of the Solar Heating and Cooling Programme (SHC) of the International Energy Agency (IEA). 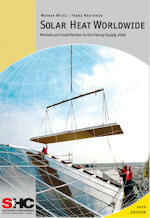 The goal of the report is to document the solar thermal capacity previously installed in the important markets world wide, and to ascertain the contribution of solar thermal systems to the supply of energy and the CO2 emissions avoided as a result of operating these systems. The collectors documented are unglazed collectors, glazed flat-plate and evacuated tube collectors with water as the energy carrier as well as glazed and unglazed air collectors. This report was prepared within the framework of the Solar Heating and Cooling Programme (SHC) of the International Energy Agency (IEA). 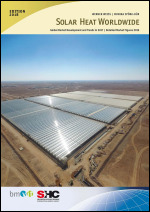 The goal of the report is to document the solar thermal capacity previously installed in the important markets worldwide, and to ascertain the contribution of solar plants to the supply of energy and the CO2 emissions avoided as a result of operating these plants. The collectors documented are unglazed collectors, glazed flat-plate and evacuated tube collectors with water as the energy carrier as well as glazed and unglazed air collectors.